Notaries Public cannot certify copies of documents. For documents, such as diplomas and school transcripts, the following procedure can be recommended: The person in possession of the document can make a photocopy and prepare a written statement that may be attached to or written on the photocopy, stating that the copy is a true and correct copy of the original. The individual will then verify the statement under oath before a notary public and the notary will indicate by a jurat that he or she has administered an oath to the testator. Copies of Public Records can be certified by a public record keeper such as the Secretary of the State or Town Clerk. Vital Records such as certificates of birth, death, and marriage can only be certified by Town Clerks, Registrars of Vital Statistics, or the Commissioner of Public Health. 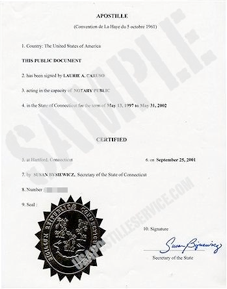 Documents submitted for authentication by apostille must be original documents recently signed by a public official of the state of Connecticut. Documents signed by officials of other states cannot be authenticated in the State of Connecticut. Photocopied, stamped, or other facsimile signatures cannot be authenticated. Documents to be authenticated must contain an original signature of a Connecticut public official whose term of office is on record with the Secretary of the State. If the document you have has a photocopied, stamped, or facsimile signature, you must have it resigned (countersigned) by the public official with his/her original signature. The only exception to this rule is for certified copies with a raised seal issued by the proper authority of a Connecticut town or the Connecticut Department of Public Health.